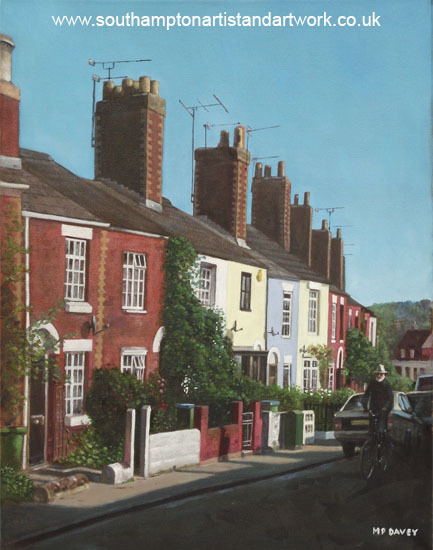 This oil painting depicts a small, quiet road in Southampton called Rockstone Lane. The terrace houses are all very small, mid Victorian examples, though they all have very large chimneys for their size. The painting is based on a photograph taken in the autumn so the shadows are very long and the light bright and clear. The cyclist was added from another picture taken a few moments later on the same street. Interest to the composition is added with the fact that the lane is built on a hill, and in addition has a bend, causing the road to curve away from the viewer. It is of interest so see how the houses, originally the to be the same, are now in different colours, and fitted with various types of windows. The normally mundane telephone cabinet and waste bins add extra interest. The artist has often spotted the man on the cycle going up the street, but not as yet told him of his inclusion within the painting! This is painted in oils on a canvas sized at 16" x 20", during early 2011.